Is it too early in the Arctic Monkeys’ young career to call their brand-new album a comeback? After all, the British oversharing-rock quartet has only been in existence for a handful of years and its now three-disc deep discography would scarcely tax any portable device’s storage capability. And yet, despite the cross-Atlantic critical buzz the group received because of their 2006 debut, the lineup’s latest effort, “Humbug,” definitely positions itself as if these Sheffield-area lads felt a slight musical correction was a necessity. Interestingly, the most powerful lever that nudged the Arctic Monkeys from the English rock underground only a couple of years ago is now something of a liability and the primary reason a stylistic reboot seemed essential. The Pitchfork-nurtured hype the group basked in after their first record, 2006’s “Whatever People Say I Am, That’s What I’m Not,” eventually dissipated when they followed it up a year later. 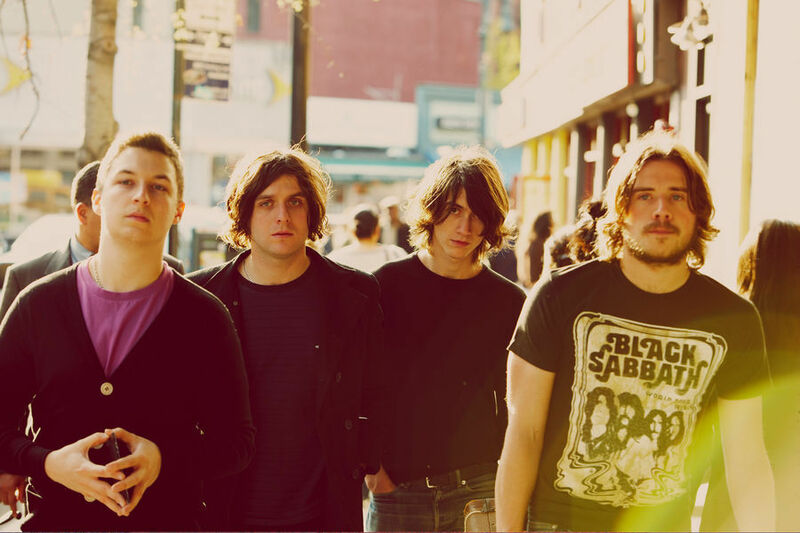 Although 2007’s “Favourite Worst Nightmare” sold nearly as well as their debut in the United Kingdom, sales declined significantly in the U.S. and Australia. All the rock-geek blogging didn’t seem to translate into that many fans who wanted to stay with the band after the keyboards stopped clacking. Of course, such a sharp demystifier as Comedy Central star Stephen Colbert could tell have told the group the truth. “You can’t eat critical acclaim,” he said to the bookish members of Gotham art-rock troupe TV on the Radio as he tempted them to sell-out their indie cred on his show last year. Colbert was right. Buzz isn’t the same as success. Critics and bloggers can help overlooked artists get noticed, but only the public’s interest expressed through financial backing — whether it’s in the form of CD purchases, legal song downloads or concert tickets — can separate big-time artists from a few scensters’ pet favorites. And after preserving through a commercial drubbing overseas, singer/band mastermind Alex Turner and the rest of the Arctic Monkeys seem to understand the task before them. Is not the album’s very title a scoff at those who’d count the group’s rise as manufactured? Or doubt their abilities? The songs on “Humbug” demonstrate that the band is committed to proving themselves in a surprisingly low-key fashion. A listen to “Humbug” should further mute any sniping about underperforming. It actually might win many more converts than the group garnered the first time around. The material from “Whatever People Say I Am, That’s What I’m Not” was musically in awe of the crunchy, frenetic riffing of British punk and post-punk as personified by the Jam, the Smiths and others. On their second album, the Monkeys became even more aggressive, turning their discombobulated melodies and caffeine-fueled verbiage into a melee. “Humbug” heads in the opposite direction. The songs represent both a step to soften the edginess of their angular-guitar rants while enriching the overall melodic framework. Overdubs aren’t streamlined into the melody, they flesh it. The Monkeys’ music is still based chiefly on screwy riffs and Turner’s Joyce-like lyricism occasionally upended with some frantic interludes, but there’s a less abrasive tone. A relaxed attitude seeps into these tracks suggesting greater confidence and less of a sense that these cuts are spontaneous creativity run amuck, that these songs are just vamps that nearly scramble away from the musicians. To tutor the band on the compositional techniques, they turned to Queens of the Stone Age leader Josh Homme. Homme produced much of the album and his influence reaches into nearly every song. In essence, the band uses his band’s sonic template imbued with their own odd sense of timing and musical jitteriness. First, Homme deserves recognition for dragging the pasty band members from England to the desert of Joshua Tree in California. As they recorded, the bleak environs had an obvious impact on the music, pushing the band to turn its back on the rampaging urban poetry of the first discs for something less pushy, less overwhelming. There’s a new laconic placidity to Turner’s vocal delivery that brings out the Morrissey influences more clearly. It’s much different from the Anglo-jive-talkin’ we heard from him before on the microphone. And yet, the new attitude doesn’t dampen his gift for analogy. Even more crucial was how Homme instructed the band to imagine the songs as bigger pieces, layering them with ghostly backing tracks and introducing vocal and instrumental harmonies. The results are songs every bit as formidable and yet, carry themselves less like a recorded street mugging and instead, something sexier and slinkier. The old songs now sound downright brutish in comparison. “Cry Lightning” is a lumbering, almost cartoonish pub crawl that grows into a bit of film noir set to bashing music. The guitar and bass trade Primus-like low-frequency mutterings and as explosive drum fills bully the plodding rhythm to keep moving past every one of Turner’s adjectives. Only during the song’s oddly tranquil middle eight and its skewing guitar solo can listeners obviously hear Homme’s lessons put into action. On “Dangerous Animals,” Homme’s role treads closer to the spotlight. He’s now offering prominent background vocals and then suggesting they break up the zig-zagging guitar rampage with brief prog-rock interludes. The band’s attack on this track is fearsome and recalls the Queens’ own minus the metal viciousness. Turner’s voice undulates above the six-stringed sputtering until the chorus when his voice blends with Homme’s and it’s really hard to tell the two apart. The Monkeys might lean a little two heavily on Homme for pointers on “Humbug”, but most of these songs are very strong despite this and there’s still enough character in their performances for the band to maintain its separate identity. In fact, on songs like “Potion Approaching” and “Pretty Visitors,” thegroup sounds surprisingly like a less goth-y, flamboyant Marilyn Manson than the Queens. Both tracks share the same sprint-stop dynamics and gabby vocals that harkens back to the Monkey’s earlier efforts only to segue into nightmarish metal territory in the songs’ second half. Even more remarkable is “Cornerstone,” a full-band acoustic love ballad in the spirit of Cat Stevens. The song’s lighter mood and romantic references hint at sappiness. Listeners are spared this indignity however thanks to such distractions as Turner’s inventive descriptions and lush layers of instrumentation. To be sure, even Homme’s participating can’t make “Humbug” the album that’s going to push the Arctic Monkeys into a stadium tour. It does validate his desire to work with the band as well as their headlining spot on this month’s Lollapalooza. And even if the album doesn’t sell like their first, success should never be the final goal. Instead, this record points toward an artistic flair and adaptability that suggest greater things from the band. At the very least, these songs should bring the Monkeys back to the good graces of the blogosphere. After all, bloggers thrive on discovering (and rediscovering) those overlooked by the shiny-obsessed music industry. “Humbug” proves that comebacks aren’t just for veterans in need of payday. They’re for anyone in need of a second chance. Tags: "Humbug", Arctic Monkeys, Josh Homme, Queens of the Stone Age, review. Bookmark the permalink.